With all of these projects that I’ve been doing I would say that more than half of the fun comes from the ‘blue sky‘ beginnings. Having no limits allows me to sit back and think, ‘wouldn’t it be cool if…’. That being said, having constraints can also inspire and force one to come up with creative solutions that you wouldn’t have with infinite resources. ANYWAY, this phone had been sitting on my shelf for years. My mom gave it to me with the hopes that I could fix it so that it would sit nicely on a table at her cabin in Tahoe. I mean, it’s a pretty cute old phone. But sadly I could not fix it but while trying I had a ‘wouldn’t it be cool’ moment. Wouldn’t it be cool if you picked up this phone and it played some sort of sound out of the receiver? You could just leave it on a table and watch people’s reactions when they pick it up. Especially if you had something shocking coming out of it. So I began to take it apart and after dozens of minutes of fiddling (thank god for breadboards and LEDs) I managed to figure out how to use the hang up switch. I used that switch to trigger the new Adafruit Audio FX Sound Board and piped the output of that to the receiver on the phone. 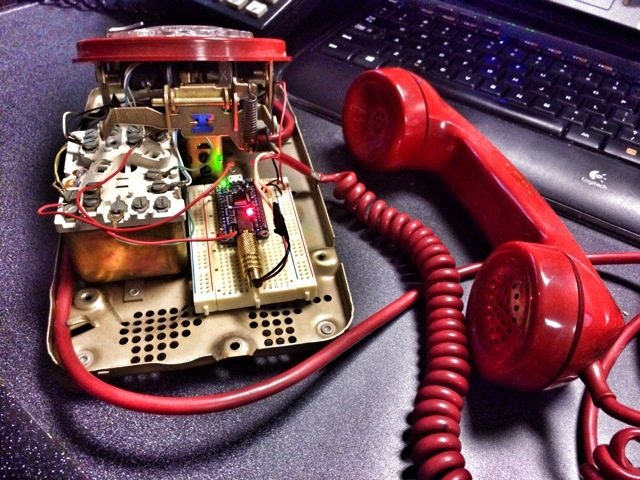 Luckily these old phones have pretty basic wiring. I ended up using a questionably appropriate sound bite so I figured that it would be best if it was not in the reach of our two year old. So I sent the whole thing to a good friend of mine. He has since put it on the bedside table in his guest room to rave reviews.